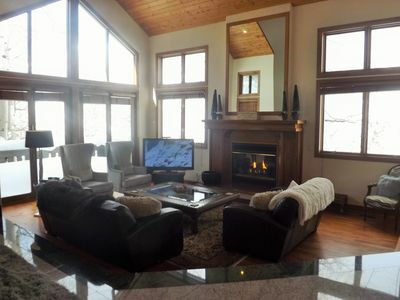 Bring your family to this Avon vacation home in summer or winter for a memorable getaway together. 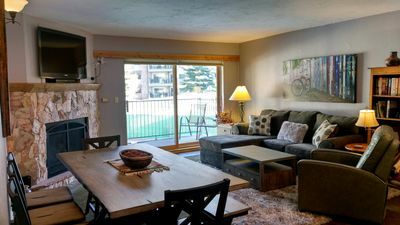 With tons of space for up to 12 guests, a wood-burning fireplace after a day of skiing, a gas grill for a summer cookout, and lots of child-friendly needs, this spacious rental is ideal. 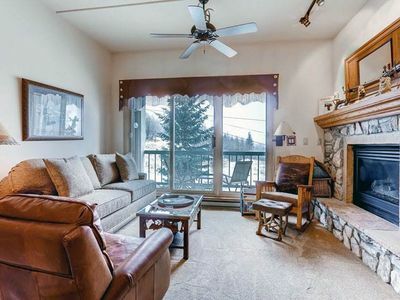 Located in Eagle-Vail, this duplex is tucked between Beaver Creek Resort and Vail Mountain Resort. Both offer Nordic skiing as well as tubing, cross-country skiing, and lessons. There's even a shuttle to the slopes. In summer, visit the Eagle-Vail Pool between hikes and mountain biking. Enter the home and head up the stairs to the main living and dining area. 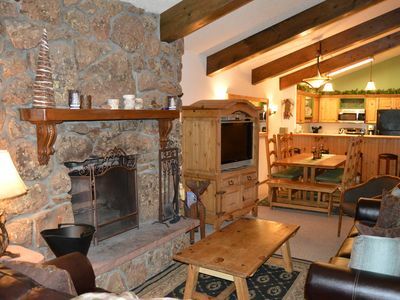 The mountain lodge decor, vaulted ceilings, and warm wood tones throughout mix with the scents and sounds of the wood-burning fire for a truly relaxing atmosphere. 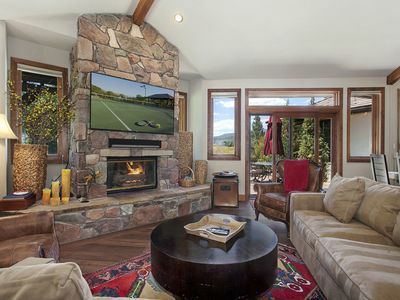 A huge flatscreen TV above the stone hearth is perfect for catching the Broncos, whether you're on one of the comfy couches or in the kitchen. 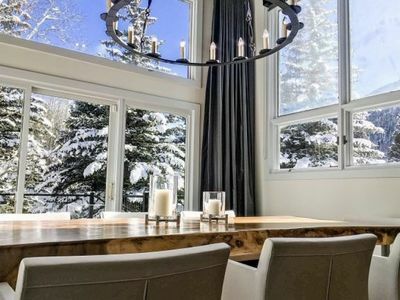 Well-stocked and modern, the kitchen has all the tools you need to make a big breakfast or an apres ski snack tray. Stock up on groceries and save money on dining out. In summer, turn on the gas grill out on the furnished deck and show off your barbecuing skills! 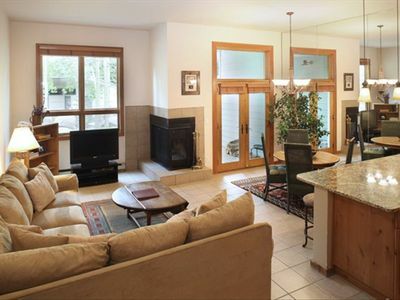 With views of the valley and trees surrounding the duplex, it's a gorgeous place to host a gathering. You can eat casually at the dining table or around the kitchen island, then clean up with the help of the dishwasher before pulling out a board game. Or, head up to the loft just above the kitchen to catch some alone time with your phone (WiFi is available) or a book. On the bottom level of the house is a cozy den with another kitchen and dining table, making it super easy for guests on each floor to grab a glass of water or store their own food. 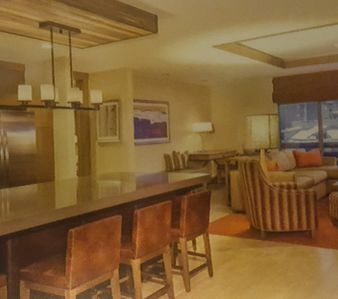 The downstairs dining table would be a great place to set up an all-night poker tournament. A bedroom with a king, twin, and full bathroom is downstairs as well. Heading up a floor are three more bedrooms: one with another king, a master suite with a queen bed and attached bathroom (with jetted tub! ), and a children's room with two toddler-size beds. Back up on the main floor is another room with a king, plus a crib for the littlest ones. Lastly, the loft has two twins and a king bed. 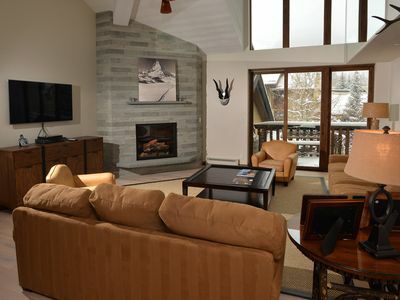 Two of the bedrooms have TVs, and one even has access to the deck and another fireplace! In addition to the toddler beds and crib, there is a baby gate, high chair, and lots of toys, making this ideal for a family or two to reunite and bring their newest additions. Lastly, a private washer and dryer will allow you to freshen up your vacation wardrobe, whether a major mess happens or you simply want to warm up your favorite hoodie. 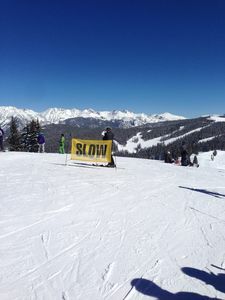 If you're with a group of friends, explore Vail Valley's many base villages for shopping and dining, as well as various events like concerts and food festivals. Summer allows for diverse possibilities in outdoor adventures from exploring hiking and biking trails (over a dozen cycling trails exist) to a round or two of golf. All year long, both Beaver Creek and Vail resorts offer tons of activities as well. Call up your siblings and best friends and let them know you found the perfect place to have a big family vacation! 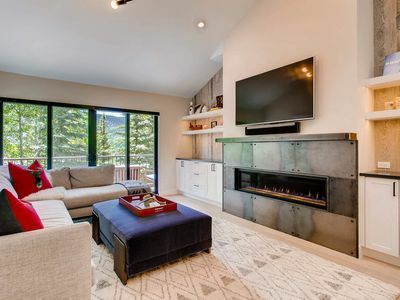 Book this Vail Valley vacation home now. Sleeps 15 with 10 beds. You will appreciate all the space that this home has to offer. 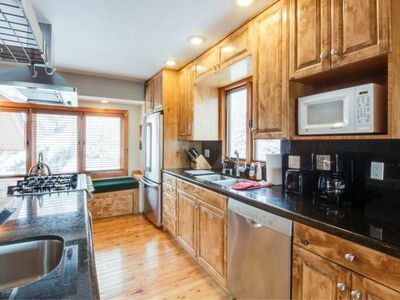 The kitchen is fully equipped featuring a slab granite island and countertops, stainless appliances, cherry cabinets, dining table with chairs, bar seating at the island, and wood burning fireplaces to warm the atmosphere. Retreat to comfortable bedrooms with high end mattresses, new linens, and plenty of space. 3400 sf of indoor space for you and your guests to enjoy. The kitchen/dining area flow into the Living Room with sliding doors providing access to the deck. 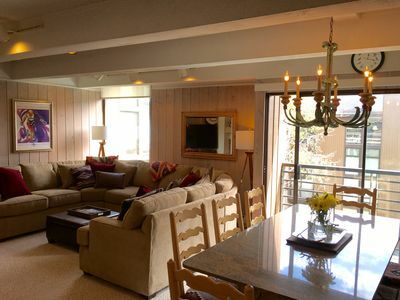 This tastefully furnished room provides comfortable seating, 56’ flat screen TV and half bath. Above the kitchen is a loft offering a king bed and 2 bench twins. 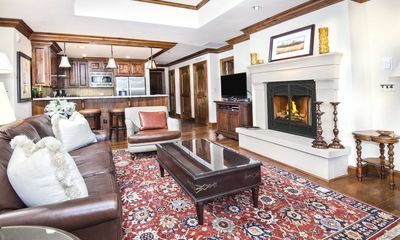 The basement has an additional kitchen, living room, and one of the Master Suites. Perfect to give two families a little separation, or extra space to spread out. 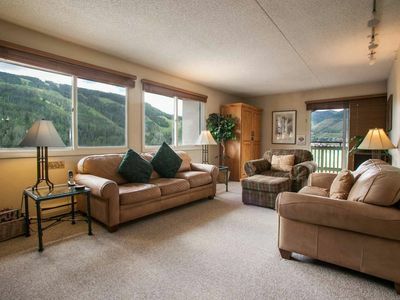 There is also a laundry room that is fully equipped for washing your ski or hiking clothes. 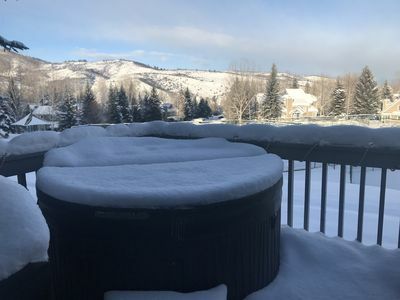 Walk out the back gate and you are a 3 minutes walk to the bus stop to get to Vail or Beaver Creek. In the summer go out to the backyard and enjoy the fenced in back yard. Nearby are parks with space to run around and a playground for kids to enjoy. The Eagle County Pool is close and the golf course is just minutes from the house. Avon is in the heart of the Vail Valley. 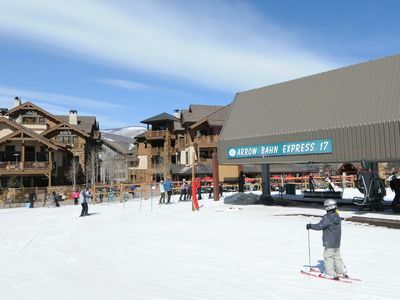 Enjoy the family-friendly, small town feel and the exclusive Beaver Creek vibe at Avon Center. 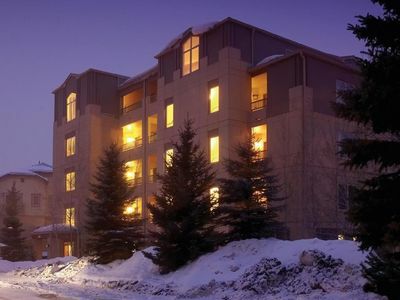 The town serves as a gateway to the Vail Valley and is only 5 miles west of Vail Resort. 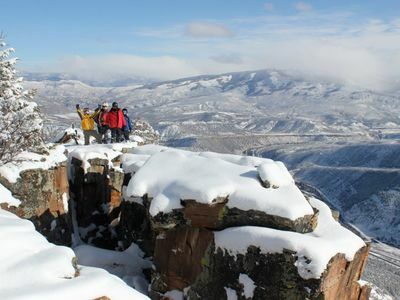 BOOK NOW FOR AN AMAZING COLORADO VACATION! 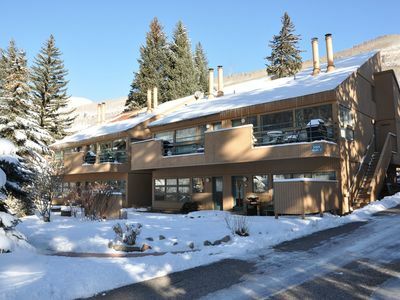 Central to Vail & Lionshead, No Need for Car, Evergreen Lodge, Yr Rnd Heated Pool & Indoor Hot Tub! 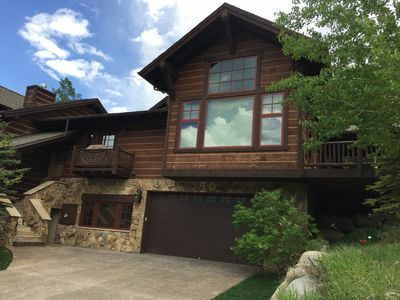 Beautiful Whiskey Hill retreat between Vail and Beaver Creek.